The positive Dog Company have produced a bag that is designed for you. This is the perfect companion for every dog walk. It combines style with functionality. Inside this canvas bag, beautifully striped lined, there is a sealed pocket for you to put all of your personal effects when out and about with the dog, your wallet, keys, mobile phone etc. The rest of the roomy bag there is plenty of space for dog treat along with space for your dog's favourite toys.On the outside of the bag, there is a mesh pocket for a small water bottle. One of the unique features of this bag is the front pocket for poo bags. 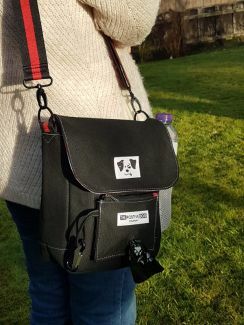 This pocket that also has space for a credit card, some cash or even the front door key and is removable is ideal if you are popping up the road to the dog-friendly café. Just take the pocket with you, and clip it to your dog lead with the carabiner that is included. Whether you are out and about in the country or taking the dog for a walk in Hyde Park in London or Central Park in New York this has to be the perfect companion.